Growing your audience data is a key to success for any business. Having more info about your clients, will allow you to better target your audience. In addition to collecting a lot of data about your audience, ProTexting has several ways to integrate the data with your other marketing providers, such as email marketing, CRM platforms, etc. via ready to us apps or our API. However, it's also important to have the right tools for gathering client information so the marketers can determine who their clients are. A web sign up form is one of the tools that businesses can use to accomplish this easily. 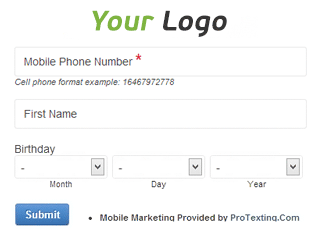 SMS Keyword Sign Up Widget – simply copy/paste a small code and place it on your website, blog, or social media account. CRM Web Forms for Lead Generation – this advanced sign up form will allow you to collect information such as names, emails, birthdates, ZIP codes, and any other custom field you’d like to have in your contacts’ database. WordPress plugin – the tool will automatically import all sign up forms you have created in your ProTexting account and you will be able to easily activate the sign up form on the WordPress blog. This feature will boost your blog readers, by allowing them to join your text messaging list. Mobile marketing is made easier and faster when businesses utilize mass text messaging and other mobile marketing platforms to make sure they send their messages to their targeted audience. SMS marketing for businesses usually involves sending simple text messages using either their mobile phones or a platform, such as ProTexting. However, it isn't a one-way street; sending out mass text messages to the right people is just one element of the whole marketing strategy. You also need a way to know who you're talking to, and ensure that you're directing your efforts to the right people at the right time.